At five in the morning, when the seafront is empty of everything apart from the scattered remains of bonfires and the odd sleeping drunk, and the bruised sky melts between the gaps in the terraced houses, Brighton can feel like a way point between worlds. The town's history of unfettered excess drapes across it like a moth-eaten curtain, mingling with a thousand day-afters' worth of regrets as the shell of the West Pier creaks like an arthritic limb: a throbbing reminder of when good times seemed limitless and the pain never came to stay. 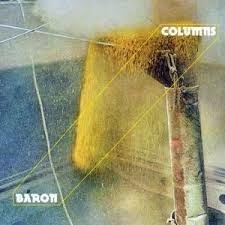 Baron's Columns evokes that liminal time. The five am of all-too-clear thoughts, chilled hands cupping lit cigarettes and heavy, unshakeable regrets. Baron's sharing of members with untethered progressive stallions Diagonal had me expecting a riot of galloping tempo changes and nostril-flared sax runs, but while progressive rock is still very much a part of Baron's DNA (or elixir vitae, as seems more appropriate) it's a different strand that is being evoked here, with Columns harking back to Vangelis's Earth, Traffic's late and almost totally unlamented Fly Like An Eagle and even Talk Talk's Spirit Of Eden. It's a subdued, slow-burning record where the vocals are crooningly intoned and the instrumentation washes across the song instead of jabbing and spitting at it. Columns is full of shaded space, the keyboards taint everything a deep, dark blue while saxes rise nomadically from the murk like Terry Riley's pink elephants. It's deep hued and heavy of brow and paces forward steadily rather than breaking into a gallop. That Baron hail from Brighton feels right: the album sounds like a stumble down the seafront during twilight - during the creaking hour - with a heavy heart, as a bottle of Lucozade turns into a magic wand in your hands. Indeed, when Columns breaks from this mode - most noticeably on the second track, 'Comea' - it serves to pull the listener out of the experience a little. Its spider dance of a riff calls to mind the great desert landscapes of more conventionally caped and sorcerous fayre: bands with names spoken of but in lore, such as Greenslade and Crabby Appleton. But the rest of Columns is a very different, very, dare I say it, urban, experience. And its hushed and reverent atmosphere, its morning-after grey pallor, is the principle reason for its charms. Yet, this is still prog, with all that that entails, including the occasional pleasingly ripe lyric. "Into the mouth of a demon messiah / Into the trance from which I never tire" croons Alex Crispin (why must the wise one speak in such confounding riddles?!) "When the prophet speaks/ He keeps more to himself than his tongue…" he sings, no doubt to a chorus of 'verily's from some imaginary mead-quaffing throng. Occasionally the mixing of these two strands produces hallucinatory results - images of urbanised wizardry, dusky rituals on top of Devil's Dyke, divining the future from the seagull innards splashed down West Street - occasionally it brings to mind Morton Harkett fronting a night-side King Crimson, which is, let's face it, even better. There's regular loveliness as well, especially when 'SSI's fizzing synthesisers and harmonised, angelic coda slip weightlessly past into the seven-minute-long closer, 'Miracle', in which keyboards jangle conspiratorially over prowling bass and drums and Crispin drops a reference to a soothsayer into the first line. Indeed, the final track sums it all up extremely well: totteringly laden with import, heavy in atmospheric detail and pleasingly, daffily pretentious, it represents the album in miniature and it's a total blast.